The 2 innovative Kodak Action Camera models, Pixpro SP360-4K and SP360-4K Dual are now available on stock at an affordable price. This is a good news for those professional film makers and fresh generation who are excited to get involved with the exploration of the 360°virtual photography world. Gone will be the day of having to wear a pair of goggles to access the 360° virtual world footage on the phone or PC. 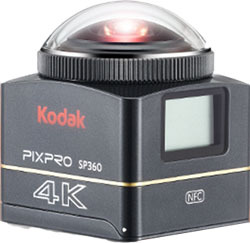 The extreme portable Kodak Pixpro SP360-4K VR Camera has an ability to capture a 4K still image and time lapse video at 360° field of view panned horizontally. The Dual package which comes with the 2x SP360-4K cameras offers an additional feature of capturing up and down view with various vantage points besides 360° horizontal shooting. The Pixpro free Stitching software is available for download to merge the 360° Virtual Reality footages from different cameras. We have presence in the following countries where you could place an order for Kodak products and collect it. The new Kodak Pixpro SP360-4K has been designed to take your creativity and passion to a whole new level with a wide range of features that will excite your vision and passion. There are two models in this series, the SP360-4K and the SP360-4K Dual with the latter consisting of a two times the SP360-4K camera. With their different features, these two models are ideal for different functionalities with the SP360-4K model a good choice for recording on the scene around you.If you, however, intend to go beyond the normal scene recording and want to take it up and down, the SP360-4K Dual will be a very convenient option for your consideration. There is stitching software that can be downloaded for free and be used on your VR videos. If you love recording your tours, love fun events, and love action, you can try out the new Kodak Pixpro SP360-4K, and you will be surprised by the unending world of opportunities it offers. Other than giving you a 360° shooting, the camera comes equipped with different fanciful pictures that place it at a considerate level above its competitors. You are a visionary person, a dreamer, and pioneer and risk taker. You know no boundaries in life and for you, there are no limits but an endless potential to achieve the untried. 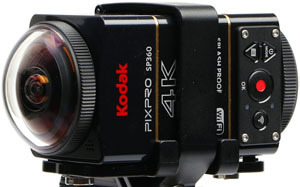 With the Kodak Pixpro SP360-4K, you can harness the spirit of your imaginations, live your dreams and record it. Picture yourself at the peak of your Everest, pause a while and capture that moment like it has never been captured before. Add live to your experience with the 360° VR and live your true vision. If you are a new user and are starting to familiarize yourself with 360° VR or a professional trying to get your game to the A zone, the SP360-4K has got it all covered for you. The camera is sold in different packages. The PREMIER pack comes with a single SP360-4K and some necessities to keep you going. Right from the moment you get your video and if you cannot wait to get your first shot, the package provides you with the basic that will start you off. For professionals or those with an untamable fire in their bellies for creating 360° VR videos, the DUAL PRO pack has just been designed for you. The package comes with two cameras plus all the necessary tools to help you get right on in creating your interactive video. The best things in life are free and better; they come in twos. With the SP360-4K camera, creating personal spherical VR videos is only half of the bigger picture. The camera was designed in a simple to use manner, and the mount was developed to offer flexibility and make it possible for users to mount two SP360-4K cameras, back to back. Now with the SP360-4K Stitch software that can be downloaded for free use on Mac or PC, users can join videos from the two separate cameras and create one immersive video in a rather simple way. With the SP360-4K, your 360° VR video experience does not end at recording. You can upload your 360° videos on your social, medium profiles or your YouTube channel with the PIXPRO SP360-4K video editing software. This software is provided free and can be used with Mac or PC. This gives you creativity freedom, and you can share your experience with the whole world. The trend nowadays is about the remote control and with the SP360-4K VR video camera; you can control it from your iOS or Android smart phone. You can also view what your recording being captured and framed with ease and flexibility. - easily overheat , within 30 mins camera shuts down ,luckily I dont normally record or for such long. Our First Shipment will arrive here in Singapore during BCA 2016, thus you may do you pre-order now. instead of the current non-VR action cameras only the front or back scene is captured and recorded depending on your cameras angle setting. It will be definitely an interesting VR recording as you can now record and view all around you. Imagine if there is some interesting outbreak of event which attract high attention instead of turning the cameras, which you may not be able to do it in time, thus missed it, VR 360 cameras will never miss the chance. Possible VR application include extreme sport, drone, capturing guests reaction around the table like cheering session,wedding program, conferences, there are just too many to be mentioned. One application worth sharing is for the touring company recording the tour journey and capturing the reaction from the tourist for a particular amazing scene, this footage can later be used for publicity purposes. If you think you could not afford the 4K model Pixpro SP360 4K, you may consider Pixpro SP360. With that I would recommend you buy a Dual pack with 2 VR cameras, this will really capture the scene in 360 while with only one VR cameras you could only capture 235 degree for 4K model and 215 degree for the standard model. Kodak will provide you with a free and simple stitching software in which you could not only able to adjust and fine turned the stitching footages , you can adjust the cameras parameter like, contract, color saturation etc too and from the same software you can upload the final to the U -tube at a finger tip.